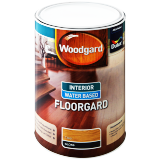 Floorgard dries to an extremely hard abrasion-resistant finish, which resists scratch marks. Resists household cleaning materials and beverage stains. A non-yellowing crystal clear sealer for wooden floors and interior wood work. Dries to a beautiful gloss finish - looks and feels like a waxed surface and highlights the natural grain.